Denali in Alaska is the highest mountain peak of the United States and North America. Denali is the third most topographically prominent and third most topographically isolated summit on Earth after Mount Everest and Aconcagua. This article comprises three sortable tables of major mountain peaks of the United States of America. The topographic elevation of a summit measures the height of the summit above a geodetic sea level. The first table below ranks the 100 highest major summits of the United States by elevation. The topographic prominence of a summit is a measure of how high the summit rises above its surroundings. The second table below ranks the 50 most prominent summits of the United States. The topographic isolation (or radius of dominance) of a summit measures how far the summit lies from its nearest point of equal elevation. The third table below ranks the 50 most isolated major summits of the United States. Of the 50 most prominent summits of the United States, only Denali exceeds 5000 meters (16,404 feet) of topographic prominence, three peaks exceed 4000 meters (13,123 feet), ten peaks exceed 3000 meters (9843 feet), 45 peaks exceed 2000 meters (6562 feet), and all 50 peaks exceed 1932 meters (6339 feet) of topographic prominence. All of these peaks are ultra-prominent summits. Mount Saint Elias is the second highest summit of both Canada and the United States. 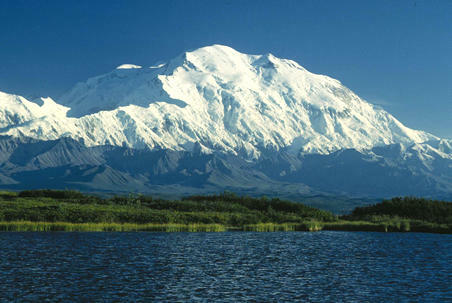 Mount Foraker is the second highest major summit of the Alaska Range. Mount Bona in Alaska is the highest volcano in the United States. Mount Blackburn in Alaska is the highest summit of the Wrangell Mountains. Mount Sanford in Alaska is the third highest volcano in the United States. Mount Fairweather lies on the Alaska-British Columbia international border. Mount Hunter is the third highest major summit of the Alaska Range. Mount Whitney highest summit of the Sierra Nevada, California, and the lower 48 states. Mount Elbert is the highest summit of Colorado and the Rocky Mountains. Mount Rainier is the highest summit of Washington and the Cascade Range. Grays Peak in Colorado is the highest point on the Continental Divide in North America. Mount Shasta in California is the highest summit of the southern Cascade Range. Pikes Peak in Colorado was the inspiration for America the Beautiful. Mount Hayes is the highest summit of the eastern Alaska Range. Gannett Peak is the highest summit of the Wind River Range, the Wyoming, and the Central Rocky Mountains. Mauna Kea on the Island of Hawaiʻi is the tallest mountain on Earth as measured from base to summit. Grand Teton in Wyoming is the highest summit of the Teton Range. Mauna Loa on the Island of Hawaiʻi is the most voluminous mountain on Earth. Kings Peak (at right) is the highest summit of the Uinta Mountains, Utah, and the Western Rocky Mountains. Mount Marcus Baker is the highest summit of the Chugach Mountains of Alaska. Wheeler Peak is the highest summit of New Mexico. Wheeler Peak in Nevada is the highest summit of the Snake Range. Granite Peak is the highest summit of the Beartooth Range and Montana. Borah Peak is the highest summit of the Lost River Range and Idaho. Humphreys Peak is the highest summit of the San Francisco Peaks and Arizona. Mount Hood is the highest summit of Oregon. Redoubt Volcano is the highest summit of the Aleutian Range. Haleakalā is the highest summit of the Island of Maui. Mount Shishaldin on Unimak Island in Alaska is the highest summit of the Aleutian Islands. Black Elk Peak is the highest summit of the Black Hills and South Dakota. Mount Mitchell is the highest summit of North Carolina and the Appalachian Mountains. Mount Washington is the highest summit of the White Mountains and New Hampshire. Tanaga Volcano is the highest summit of Tanaga Island in the Aleutian Islands. ^ All elevations in the 48 states of the contiguous United States include an elevation adjustment from the National Geodetic Vertical Datum of 1929 (NGVD 29) to the North American Vertical Datum of 1988 (NAVD 88). For further information, please see this United States National Geodetic Survey note. ^ a b c The summit of Denali is the highest point of the Alaska Range, the State of Alaska, the United States of America, and greater North America. Denali is the third most topographically prominent and third most topographically isolated summit on Earth after Mount Everest and Aconcagua. ^ a b Mount Saint Elias is the second highest major summit of both Canada and the United States. ^ a b "Mount Saint Elias". Peakbagger.com. Retrieved May 3, 2016. ^ a b "Mount Saint Elias". Bivouac.com. Retrieved May 3, 2016. ^ a b Mount Foraker is the westernmost 5000-meter (16,404-foot) summit of Alaska, the United States, and greater North America. ^ a b "Mount Foraker". Peakbagger.com. Retrieved May 3, 2016. ^ a b "Mount Foraker". Bivouac.com. Retrieved May 3, 2016. ^ a b The summit of Mount Bona is the highest point of the northwest Saint Elias Mountains. ^ a b "Mount Bona". Peakbagger.com. Retrieved May 3, 2016. ^ a b "Mount Bona". Bivouac.com. Retrieved May 3, 2016. ^ a b The summit of Mount Blackburn is the highest point of the Wrangell Mountains. ^ a b "MT BLACKBURN". Datasheet for NGS Station UV4136. U.S. National Geodetic Survey. Retrieved May 3, 2016. ^ a b "Mount Blackburn". Peakbagger.com. Retrieved May 3, 2016. ^ a b "Mount Blackburn". Bivouac.com. Retrieved May 3, 2016. ^ a b "Mount Sanford". Peakbagger.com. Retrieved May 3, 2016. ^ a b "Mount Sanford". Bivouac.com. Retrieved May 3, 2016. ^ a b c Mount Fairweather lies on the international border between Alaska and British Columbia. The peak is the highest point of the Canadian Province of British Columbia and the southernmost and easternmost summit of its elevation in both Canada and the United States. ^ a b c "Mount Fairweather". Peakbagger.com. Retrieved May 3, 2016. ^ a b c "Mount Fairweather". Bivouac.com. Retrieved May 3, 2016. ^ a b "Mount Hubbard". Peakbagger.com. Retrieved May 3, 2016. ^ a b "Mount Hubbard". Bivouac.com. Retrieved May 3, 2016. ^ "Mount Bear". Peakbagger.com. Retrieved May 3, 2016. ^ "Mount Bear". Bivouac.com. Retrieved May 3, 2016. ^ "Mount Hunter". Peakbagger.com. Retrieved May 3, 2016. ^ "Mount Hunter". Bivouac.com. Retrieved May 3, 2016. ^ a b c The summit of Mount Whitney is the highest point of the Sierra Nevada, the State of California, and the contiguous United States. ^ a b c Mount Whitney is the southernmost and easternmost summit of its elevation in United States. ^ a b c "WHITNEY". Datasheet for NGS Station GT1811. U.S. National Geodetic Survey. Retrieved May 3, 2016. ^ a b c "Mount Whitney". Peakbagger.com. Retrieved May 3, 2016. ^ a b c "Mount Whitney". Bivouac.com. Retrieved May 3, 2016. ^ "BOUNDARY POINT 180". Datasheet for NGS Station UV3032. U.S. National Geodetic Survey. Retrieved May 3, 2016. ^ "Mount Alverstone". Peakbagger.com. Retrieved May 3, 2016. ^ "Mount Alverstone". Bivouac.com. Retrieved May 3, 2016. ^ "University Peak". Peakbagger.com. Retrieved May 3, 2016. ^ "University Peak". Bivouac.com. Retrieved May 3, 2016. ^ a b c The summit of Mount Elbert is the highest point of the U.S. State of Colorado, the Rocky Mountains of North America, and the entire Mississippi River drainage basin. ^ a b c "MOUNT ELBERT". Datasheet for NGS Station KL0637. U.S. National Geodetic Survey. Retrieved May 3, 2016. ^ a b c "Mount Elbert". Peakbagger.com. Retrieved May 3, 2016. ^ a b c "Mount Elbert". Bivouac.com. Retrieved May 3, 2016. ^ Mount Massive is the second highest major summit of the Rocky Mountains. ^ "MOUNT MASSIVE CAIRN". Datasheet for NGS Station KL0640. U.S. National Geodetic Survey. Retrieved May 3, 2016. ^ The elevation of Mount Massive includes an adjustment of + m (6.85 ft) from NGVD 29 to NAVD 88. ^ "Mount Massive". Peakbagger.com. Retrieved May 3, 2016. ^ "Mount Massive". Bivouac.com. Retrieved May 3, 2016. ^ The summit of Mount Harvard is the highest point of the Collegiate Peaks. ^ Mount Harvard is the southernmost and easternmost summit of its elevation in the Rocky Mountains. ^ "HARVARD". Datasheet for NGS Station JL0879. U.S. National Geodetic Survey. Retrieved May 3, 2016. ^ "Mount Harvard". Peakbagger.com. Retrieved May 3, 2016. ^ "Mount Harvard". Bivouac.com. Retrieved May 3, 2016. ^ a b c The summit of Mount Rainier is the highest point of the Cascade Range and the U.S. State of Washington. Mount Rainier is the most prominent summit in the contiguous United States and the fourth most prominent in North America. ^ a b c The elevation of Mount Rainier includes an adjustment of + m (6.28 ft) from NGVD 29 to NAVD 88. ^ a b c "Mount Rainier". Peakbagger.com. Retrieved May 3, 2016. ^ a b c "Mount Rainier". Bivouac.com. Retrieved May 3, 2016. ^ The elevation of Mount Williamson includes an adjustment of + m (5.93 ft) from NGVD 29 to NAVD 88. ^ "Mount Williamson". Peakbagger.com. Retrieved May 3, 2016. ^ "Mount Williamson". Bivouac.com. Retrieved May 3, 2016. ^ a b The summit of Blanca Peak is the highest point of the Sangre de Cristo Mountains and the entire Rio Grande drainage basin. ^ a b Blanca Peak is the southernmost ultra-prominent summit of the Rocky Mountains. ^ a b The elevation of Blanca Peak includes an adjustment of + m (5.76 ft) from NGVD 29 to NAVD 88. ^ a b "Blanca Peak". Peakbagger.com. Retrieved May 3, 2016. ^ a b "Blanca Peak". Bivouac.com. Retrieved May 3, 2016. ^ The elevation of La Plata Peak includes an adjustment of + m (6.51 ft) from NGVD 29 to NAVD 88. ^ "La Plata Peak". Peakbagger.com. Retrieved May 3, 2016. ^ "La Plata Peak". Bivouac.com. Retrieved May 3, 2016. ^ The summit of Uncompahgre Peak is the highest point of the San Juan Mountains and the entire Gulf of California drainage basin. ^ Uncompahgre Peak is the westernmost summit of its elevation in the Rocky Mountains. ^ "UNCOMPAHGRE". Datasheet for NGS Station JL0798. U.S. National Geodetic Survey. Retrieved May 3, 2016. ^ "Uncompahgre Peak". Peakbagger.com. Retrieved May 3, 2016. ^ "Uncompahgre Peak". Bivouac.com. Retrieved May 3, 2016. ^ The summit of Crestone Peak is the highest point of the Crestones. ^ The elevation of Crestone Peak includes an adjustment of + m (5.77 ft) from NGVD 29 to NAVD 88. ^ "Crestone Peak". Peakbagger.com. Retrieved May 3, 2016. ^ "Crestone Peak". Bivouac.com. Retrieved May 3, 2016. ^ The summit of Mount Lincoln is the highest point of the Mosquito Range and the entire Missouri River drainage basin. ^ Mount Lincoln is the northernmost summit of its elevation in the Rocky Mountains. ^ "MT LINCOLN". Datasheet for NGS Station KL0627. U.S. National Geodetic Survey. Retrieved May 3, 2016. ^ "Mount Lincoln". Peakbagger.com. Retrieved May 3, 2016. ^ "Mount Lincoln". Bivouac.com. Retrieved May 3, 2016. ^ The summit of Castle Peak is the highest point of the Elk Mountains. ^ "CASTLE PK". Datasheet for NGS Station KL0659. U.S. National Geodetic Survey. Retrieved May 3, 2016. ^ "Castle Peak". Peakbagger.com. Retrieved May 3, 2016. ^ "Castle Peak". Bivouac.com. Retrieved May 3, 2016. ^ The summit of Grays Peak is the highest point of the Front Range and the Continental Divide in North America. ^ Grays Peak is the northernmost summit of its elevation in the Rocky Mountains. ^ "GRAYS PEAK". Datasheet for NGS Station KK2036. U.S. National Geodetic Survey. Retrieved May 3, 2016. ^ "Grays Peak". Peakbagger.com. Retrieved May 3, 2016. ^ "Grays Peak". Bivouac.com. Retrieved May 3, 2016. ^ The summit of Mount Antero is the highest point of the southern Sawatch Range. ^ "MT ANTERO". Datasheet for NGS Station JL0883. U.S. National Geodetic Survey. Retrieved May 3, 2016. ^ "Mount Antero". Peakbagger.com. Retrieved May 3, 2016. ^ "Mount Antero". Bivouac.com. Retrieved May 3, 2016. ^ "EVANS". Datasheet for NGS Station KK2030. U.S. National Geodetic Survey. Retrieved May 3, 2016. ^ The summit elevation of Mount Evans includes a vertical offset of + m (5.9 ft) from the station benchmark. ^ "Mount Evans". Peakbagger.com. Retrieved May 3, 2016. ^ "Mount Evans". Bivouac.com. Retrieved May 3, 2016. ^ The summit of Longs Peak is the highest point of the northern Front Range. ^ Longs Peak is the northernmost 14,000-foot (4267-meter) summit of the Rocky Mountains. ^ "LONGS PEAK". Datasheet for NGS Station LL1346. U.S. National Geodetic Survey. Retrieved May 3, 2016. ^ "Longs Peak". Peakbagger.com. Retrieved May 3, 2016. ^ "Longs Peak". Bivouac.com. Retrieved May 3, 2016. ^ The summit of Mount Wilson is the highest point of the San Miguel Mountains. ^ Mount Wilson is the westernmost summit of its elevation in the Rocky Mountains. ^ The elevation of Mount Wilson includes an adjustment of + m (6.23 ft) from NGVD 29 to NAVD 88. ^ "Mount Wilson". Peakbagger.com. Retrieved May 3, 2016. ^ "Mount Wilson". Bivouac.com. Retrieved May 3, 2016. ^ a b The summit of White Mountain Peak is the highest point of the White Mountains. ^ a b "WHITE MOUNTAIN PEAK". Datasheet for NGS Station HR2559. U.S. National Geodetic Survey. Retrieved May 3, 2016. ^ a b "White Mountain Peak". Peakbagger.com. Retrieved May 3, 2016. ^ a b "White Mountain Peak". Bivouac.com. Retrieved May 3, 2016. ^ The summit of North Palisade is the highest point of the Palisades. ^ "NORTH PALISADE". Datasheet for NGS Station HR2629. U.S. National Geodetic Survey. Retrieved May 3, 2016. ^ The elevation of North Palisade includes an adjustment of + m (6.13 ft) from NGVD 29 to NAVD 88. ^ "North Palisade". Peakbagger.com. Retrieved May 3, 2016. ^ "North Palisade". Bivouac.com. Retrieved May 3, 2016. ^ "PRINCETON". Datasheet for NGS Station JL0886. U.S. National Geodetic Survey. Retrieved May 3, 2016. ^ "Mount Princeton". Peakbagger.com. Retrieved May 3, 2016. ^ "Mount Princeton". Bivouac.com. Retrieved May 3, 2016. ^ "YALE". Datasheet for NGS Station JL0889. U.S. National Geodetic Survey. Retrieved May 3, 2016. ^ "Mount Yale". Peakbagger.com. Retrieved May 3, 2016. ^ "Mount Yale". Bivouac.com. Retrieved May 3, 2016. ^ a b c The summit of Mount Shasta is the highest point of the southern Cascade Range. ^ a b c "MT SHASTA". Datasheet for NGS Station MX1016. U.S. National Geodetic Survey. Retrieved May 3, 2016. ^ a b c "Mount Shasta". Peakbagger.com. Retrieved May 3, 2016. ^ a b c "Mount Shasta". Bivouac.com. Retrieved May 3, 2016. ^ "MAROON PEAK". Datasheet for NGS Station KL0805. U.S. National Geodetic Survey. Retrieved May 3, 2016. ^ "Maroon Peak". Peakbagger.com. Retrieved May 3, 2016. ^ "Maroon Peak". Bivouac.com. Retrieved May 3, 2016. ^ "Mount Wrangell". Peakbagger.com. Retrieved May 3, 2016. ^ "Mount Wrangell". Bivouac.com. Retrieved May 3, 2016. ^ The summit of Mount Sneffels is the highest point of the Sneffels Range. ^ "SNEFFLES". Datasheet for NGS Station JL0826. U.S. National Geodetic Survey. Retrieved May 3, 2016. ^ "Mount Sneffels". Peakbagger.com. Retrieved May 3, 2016. ^ "Mount Sneffels". Bivouac.com. Retrieved May 3, 2016. ^ "CAPITOL PK". Datasheet for NGS Station KL0688. U.S. National Geodetic Survey. Retrieved May 3, 2016. ^ The elevation of Capitol Peak includes an adjustment of + m (6.53 ft) from NGVD 29 to NAVD 88. ^ "Capitol Peak". Peakbagger.com. Retrieved May 3, 2016. ^ "Capitol Peak". Bivouac.com. Retrieved May 3, 2016. ^ Pikes Peak is the easternmost 14,000-foot (4267-meter) summit and ultra-prominent summit of the Rocky Mountains. Pikes Peak was the inspiration for the lyrics of America the Beautiful. ^ "PIKES PEAK". Datasheet for NGS Station JK1242. U.S. National Geodetic Survey. Retrieved May 3, 2016. ^ "Pikes Peak". Peakbagger.com. Retrieved May 3, 2016. ^ "Pikes Peak". Bivouac.com. Retrieved May 3, 2016. ^ The summit of Windom Peak is the highest point of the Needle Mountains. ^ Mount Eolus may be higher than Windom Peak. ^ The elevation of Windom Peak includes an adjustment of + m (5.86 ft) from NGVD 29 to NAVD 88. ^ "Windom Peak". Peakbagger.com. Retrieved May 3, 2016. ^ "Windom Peak". Bivouac.com. Retrieved May 3, 2016. ^ "Mount Augusta". Peakbagger.com. Retrieved May 3, 2016. ^ "Mount Augusta". Bivouac.com. Retrieved May 3, 2016. ^ "HANDIES". Datasheet for NGS Station HL0635. U.S. National Geodetic Survey. Retrieved May 3, 2016. ^ "Handies Peak". Peakbagger.com. Retrieved May 3, 2016. ^ "Handies Peak". Bivouac.com. Retrieved May 3, 2016. ^ The summit of Culebra Peak is the highest point of the Culebra Range. ^ Culebra Peak is the southernmost 14,000-foot (4267-meter) summit of the Rocky Mountains. ^ The elevation of Culebra Peak includes an adjustment of + m (5.71 ft) from NGVD 29 to NAVD 88. ^ "Culebra Peak". Peakbagger.com. Retrieved May 3, 2016. ^ "Culebra Peak". Bivouac.com. Retrieved May 3, 2016. ^ The summit of San Luis Peak is the highest point of the La Garita Mountains. ^ "SAN LUIS PEAK CAIRN". Datasheet for NGS Station HL0570. U.S. National Geodetic Survey. Retrieved May 3, 2016. ^ "San Luis Peak". Peakbagger.com. Retrieved May 3, 2016. ^ "San Luis Peak". Bivouac.com. Retrieved May 3, 2016. ^ The summit of Mount of the Holy Cross is the highest point of the northern Sawatch Range. ^ "MT HOLY CROSS ET". Datasheet for NGS Station KL0649. U.S. National Geodetic Survey. Retrieved May 3, 2016. ^ The summit elevation of Mount of the Holy Cross includes a vertical offset of + m (2 ft) from the station benchmark. ^ "Mount of the Holy Cross". Peakbagger.com. Retrieved May 3, 2016. ^ "Mount of the Holy Cross". Bivouac.com. Retrieved May 3, 2016. ^ The elevation of Sunshine Peak includes an adjustment of + m (6.46 ft) from NGVD 29 to NAVD 88. ^ "Sunshine Peak". Peakbagger.com. Retrieved 3 March 2016. ^ "Sunshine Peak". Bivouac.com. Retrieved 3 March 2016. ^ "GRIZZLY". Datasheet for NGS Station KL0800. U.S. National Geodetic Survey. Retrieved May 3, 2016. ^ "Grizzly Peak". Peakbagger.com. Retrieved May 3, 2016. ^ "Grizzly Peak". Bivouac.com. Retrieved May 3, 2016. ^ "MT HUMPHREYS". Datasheet for NGS Station HR2626. U.S. National Geodetic Survey. Retrieved May 3, 2016. ^ The elevation of Mount Humphreys includes an adjustment of + m (6.04 ft) from NGVD 29 to NAVD 88. ^ "Mount Humphreys". Peakbagger.com. Retrieved May 3, 2016. ^ "Mount Humphreys". Bivouac.com. Retrieved May 3, 2016. ^ "MT KEITH". Datasheet for NGS Station GT1807. U.S. National Geodetic Survey. Retrieved May 3, 2016. ^ The elevation of Mount Keith includes an adjustment of + m (5.89 ft) from NGVD 29 to NAVD 88. ^ "Mount Keith". Peakbagger.com. Retrieved May 3, 2016. ^ "Mount Keith". Bivouac.com. Retrieved May 3, 2016. ^ The summit of Mount Ouray is the highest point of the far southern Sawatch Range. ^ "MOUNT OURAY RESET". Datasheet for NGS Station JL0672. U.S. National Geodetic Survey. Retrieved May 3, 2016. ^ "Mount Ouray". Peakbagger.com. Retrieved May 3, 2016. ^ "Mount Ouray". Bivouac.com. Retrieved May 3, 2016. ^ The elevation of Vermilion Peak includes an adjustment of + m (5.99 ft) from NGVD 29 to NAVD 88. ^ "Vermilion Peak". Peakbagger.com. Retrieved May 3, 2016. ^ "Vermilion Peak". Bivouac.com. Retrieved May 3, 2016. ^ "Atna Peaks". Peakbagger.com. Retrieved May 3, 2016. ^ "Atna Peaks". Bivouac.com. Retrieved May 3, 2016. ^ "REGAL MOUNTAIN". Datasheet for NGS Station UV4133. U.S. National Geodetic Survey. Retrieved May 3, 2016. ^ "Regal Mountain". Peakbagger.com. Retrieved May 3, 2016. ^ "Regal Mountain". Bivouac.com. Retrieved May 3, 2016. ^ "MT DARWIN". Datasheet for NGS Station HR2631. U.S. National Geodetic Survey. Retrieved May 3, 2016. ^ The elevation of Mount Darwin includes an adjustment of + m (6.19 ft) from NGVD 29 to NAVD 88. ^ "Mount Darwin". Peakbagger.com. Retrieved May 3, 2016. ^ "Mount Darwin". Bivouac.com. Retrieved May 3, 2016. ^ a b c The summit of Mount Hayes is the highest point of the Hayes Range. ^ a b c Mount Hayes is the northernmost 4000-meter (13,123-foot) summit of Alaska, the United States, and greater North America. ^ a b c "Mount Hayes". Peakbagger.com. Retrieved May 3, 2016. ^ a b c "Mount Hayes". Bivouac.com. Retrieved May 3, 2016. ^ "SILVERHEELS ET". Datasheet for NGS Station KL0629. U.S. National Geodetic Survey. Retrieved May 3, 2016. ^ "Mount Silverheels". Peakbagger.com. Retrieved May 3, 2016. ^ "Mount Silverheels". Bivouac.com. Retrieved May 3, 2016. ^ "PYRAMID". Datasheet for NGS Station HL0589. U.S. National Geodetic Survey. Retrieved May 3, 2016. ^ "Rio Grande Pyramid". Peakbagger.com. Retrieved May 3, 2016. ^ "Rio Grande Pyramid". Bivouac.com. Retrieved May 3, 2016. ^ a b c The summit of Gannett Peak is the highest point of the Wind River Range, the U.S. State of Wyoming, and the central Rocky Mountains. ^ a b c Gannett Peak is the northernmost and westernmost summit of its elevation in the Rocky Mountains. ^ a b c "GANNETT PEAK CAIRN". Datasheet for NGS Station OW0356. U.S. National Geodetic Survey. Retrieved May 3, 2016. ^ a b c "Gannett Peak". Peakbagger.com. Retrieved May 3, 2016. ^ a b c "Gannett Peak". Bivouac.com. Retrieved May 3, 2016. ^ The summit of Mount Kaweah is the highest point of the Great Western Divide. ^ Mount Kaweah is the southernmost summit of its elevation in United States. ^ The elevation of Mount Kaweah includes an adjustment of + m (5.42 ft) from NGVD 29 to NAVD 88. ^ "Mount Kaweah". Peakbagger.com. Retrieved May 3, 2016. ^ "Mount Kaweah". Bivouac.com. Retrieved May 3, 2016. ^ a b c The summit of Mauna Kea is the highest point of the Island of Hawaiʻi, the U.S. State of Hawaiʻi, and all islands of the Pacific Ocean. ^ a b c Mauna Kea is the tallest mountain on Earth as measured from base to summit. The shield volcano sits on the ocean floor at a depth of 5998 meters (19,678 feet) for a total height of 10,205.3 meters (33,482 feet). ^ a b c "SUMMIT". Datasheet for NGS Station TU2314. U.S. National Geodetic Survey. Retrieved May 3, 2016. ^ a b c "Mauna Kea". Peakbagger.com. Retrieved May 3, 2016. ^ a b c "Mauna Kea". Bivouac.com. Retrieved May 3, 2016. ^ a b The summit of Grand Teton is the highest point of the Teton Range. ^ a b Grand Teton is the northernmost and westernmost 4000-meter (13,123-foot) summit of the Rocky Mountains. ^ a b "GRAND TETON". Datasheet for NGS Station OX0838. U.S. National Geodetic Survey. Retrieved May 3, 2016. ^ a b "Grand Teton". Peakbagger.com. Retrieved May 3, 2016. ^ a b "Grand Teton". Bivouac.com. Retrieved May 3, 2016. ^ a b "Mount Cook". Peakbagger.com. Retrieved May 3, 2016. ^ a b "Mount Cook". Bivouac.com. Retrieved May 3, 2016. ^ "MORGAN". Datasheet for NGS Station HR2627. U.S. National Geodetic Survey. Retrieved May 3, 2016. ^ "Mount Morgan". Peakbagger.com. Retrieved May 3, 2016. ^ "Mount Morgan". Bivouac.com. Retrieved May 3, 2016. ^ The elevation of Mount Gabb includes an adjustment of + m (6.42 ft) from NGVD 29 to NAVD 88. ^ "Mount Gabb". Peakbagger.com. Retrieved May 3, 2016. ^ "Mount Gabb". Bivouac.com. Retrieved May 3, 2016. ^ The elevation of Bald Mountain includes an adjustment of + m (6.31 ft) from NGVD 29 to NAVD 88. ^ "Bald Mountain". Peakbagger.com. Retrieved May 3, 2016. ^ "Bald Mountain". Bivouac.com. Retrieved May 3, 2016. ^ The elevation of Mount Oso includes an adjustment of + m (5.83 ft) from NGVD 29 to NAVD 88. ^ "Mount Oso". Peakbagger.com. Retrieved May 3, 2016. ^ "Mount Oso". Bivouac.com. Retrieved May 3, 2016. ^ a b Mauna Loa is the southernmost and westernmost 4000-meter (13,123-foot) summit of Hawaiʻi and the United States. ^ a b The shield volcano Mauna Loa is the most voluminous mountain on Earth with an estimated volume of 74,000 km³ (17,800 cubic miles), or enough material to fill the Grand Canyon more than 18 times. ^ a b "Mauna Loa". Peakbagger.com. Retrieved May 3, 2016. ^ a b "Mauna Loa". Bivouac.com. Retrieved May 3, 2016. ^ "MT JACKSON ET". Datasheet for NGS Station KL0650. U.S. National Geodetic Survey. Retrieved May 3, 2016. ^ "Mount Jackson". Peakbagger.com. Retrieved May 3, 2016. ^ "Mount Jackson". Bivouac.com. Retrieved May 3, 2016. ^ "MT TOM LOOKOUT TOWER". Datasheet for NGS Station HR2770. U.S. National Geodetic Survey. Retrieved May 3, 2016. ^ The elevation of Mount Tom includes an adjustment of + m (4.52 ft) from NGVD 29 to NAVD 88. ^ "Mount Tom". Peakbagger.com. Retrieved May 3, 2016. ^ "Mount Tom". Bivouac.com. Retrieved May 3, 2016. ^ The elevation of Bard Peak includes an adjustment of + m (5.6 ft) from NGVD 29 to NAVD 88. ^ "Bard Peak". Peakbagger.com. Retrieved May 3, 2016. ^ "Bard Peak". Bivouac.com. Retrieved May 3, 2016. ^ West Spanish Peak is the easternmost 4000-meter (13,123-foot) summit of the Rocky Mountains and the United States. ^ The elevation of West Spanish Peak includes an adjustment of + m (4.82 ft) from NGVD 29 to NAVD 88. ^ "West Spanish Peak". Peakbagger.com. Retrieved May 3, 2016. ^ "West Spanish Peak". Bivouac.com. Retrieved May 3, 2016. ^ The summit of Mount Powell is the highest point of the Gore Range. ^ The elevation of Mount Powell includes an adjustment of + m (5.81 ft) from NGVD 29 to NAVD 88. ^ "Mount Powell". Peakbagger.com. Retrieved May 3, 2016. ^ "Mount Powell". Bivouac.com. Retrieved May 3, 2016. ^ The summit of Hagues Peak is the highest point of the Mummy Range. ^ "HAGUE RM". Datasheet for NGS Station LL1350. U.S. National Geodetic Survey. Retrieved May 3, 2016. ^ "Hagues Peak". Peakbagger.com. Retrieved May 3, 2016. ^ "Hagues Peak". Bivouac.com. Retrieved May 3, 2016. ^ The elevation of Mount Dubois includes an adjustment of + m (6.16 ft) from NGVD 29 to NAVD 88. ^ "Mount Dubois". Peakbagger.com. Retrieved May 3, 2016. ^ "Mount Dubois". Bivouac.com. Retrieved May 3, 2016. ^ The elevation of Tower Mountain includes an adjustment of + m (5.89 ft) from NGVD 29 to NAVD 88. ^ "Tower Mountain". Peakbagger.com. Retrieved May 3, 2016. ^ "Tower Mountain". Bivouac.com. Retrieved May 3, 2016. ^ The elevation of Treasure Mountain includes an adjustment of + m (6.59 ft) from NGVD 29 to NAVD 88. ^ "Treasure Mountain". Peakbagger.com. Retrieved May 3, 2016. ^ "Treasure Mountain". Bivouac.com. Retrieved May 3, 2016. ^ a b c The summit of Kings Peak is the highest point of the Uinta Mountains, the U.S. State of Utah, and the western Rocky Mountains. ^ a b c The elevation of Kings Peak includes an adjustment of + m (5.93 ft) from NGVD 29 to NAVD 88. ^ a b c "Kings Peak". Peakbagger.com. Retrieved May 3, 2016. ^ a b c "Kings Peak". Bivouac.com. Retrieved May 3, 2016. ^ The summit of North Arapaho Peak is the highest point of the Indian Peaks. ^ "NORTH ARAPAHOE PEAK CAIRN". Datasheet for NGS Station LL1357. U.S. National Geodetic Survey. Retrieved May 3, 2016. ^ The elevation of North Arapaho Peak includes an adjustment of + m (5.78 ft) from NGVD 29 to NAVD 88. ^ "North Arapaho Peak". Peakbagger.com. Retrieved May 3, 2016. ^ "North Arapaho Peak". Bivouac.com. Retrieved May 3, 2016. ^ The elevation of Mount Pinchot includes an adjustment of + m (5.94 ft) from NGVD 29 to NAVD 88. ^ "Mount Pinchot". Peakbagger.com. Retrieved May 3, 2016. ^ "Mount Pinchot". Bivouac.com. Retrieved May 3, 2016. ^ "Mount Natazhat". Peakbagger.com. Retrieved May 3, 2016. ^ "Mount Natazhat". Bivouac.com. Retrieved May 3, 2016. ^ "Mount Jarvis". Peakbagger.com. Retrieved May 3, 2016. ^ "Mount Jarvis". Bivouac.com. Retrieved May 3, 2016. ^ The elevation of Parry Peak includes an adjustment of + m (5.78 ft) from NGVD 29 to NAVD 88. ^ "Parry Peak". Peakbagger.com. Retrieved May 3, 2016. ^ "Parry Peak". Bivouac.com. Retrieved May 3, 2016. ^ The summit of Bill Williams Peak is the highest point of the Williams Mountains. ^ The elevation of Bill Williams Peak includes an adjustment of + m (6.71 ft) from NGVD 29 to NAVD 88. ^ "Bill Williams Peak". Peakbagger.com. Retrieved May 3, 2016. ^ "Bill Williams Peak". Bivouac.com. Retrieved May 3, 2016. ^ The elevation of Sultan Mountain includes an adjustment of + m (5.41 ft) from NGVD 29 to NAVD 88. ^ "Sultan Mountain". Peakbagger.com. Retrieved May 3, 2016. ^ "Sultan Mountain". Bivouac.com. Retrieved May 3, 2016. ^ The elevation of Mount Herard includes an adjustment of + m (5.38 ft) from NGVD 29 to NAVD 88. ^ "Mount Herard". Peakbagger.com. Retrieved May 3, 2016. ^ "Mount Herard". Bivouac.com. Retrieved May 3, 2016. ^ "BUFFALO WEST PEAK CAIRN". Datasheet for NGS Station JL0653. U.S. National Geodetic Survey. Retrieved May 3, 2016. ^ The elevation of West Buffalo Peak includes an adjustment of + m (6.02 ft) from NGVD 29 to NAVD 88. ^ "West Buffalo Peak". Peakbagger.com. Retrieved May 3, 2016. ^ "West Buffalo Peak". Bivouac.com. Retrieved May 3, 2016. ^ "Tressider Peak". Peakbagger.com. Retrieved May 3, 2016. ^ "Tressider Peak". Bivouac.com. Retrieved May 3, 2016. ^ The summit of Summit Peak is the highest point of the southern San Juan Mountains. ^ "SUMMIT". Datasheet for NGS Station HL0503. U.S. National Geodetic Survey. Retrieved May 3, 2016. ^ "Summit Peak". Peakbagger.com. Retrieved May 3, 2016. ^ "Summit Peak". Bivouac.com. Retrieved May 3, 2016. ^ Dolores Peak may be higher than Middle Peak. ^ The elevation of Middle Peak includes an adjustment of + m (5.94 ft) from NGVD 29 to NAVD 88. ^ "Middle Peak". Peakbagger.com. Retrieved May 3, 2016. ^ "Middle Peak". Bivouac.com. Retrieved May 3, 2016. ^ The elevation of Antora Peak includes an adjustment of + m (6.18 ft) from NGVD 29 to NAVD 88. ^ "Antora Peak". Peakbagger.com. Retrieved May 3, 2016. ^ "Antora Peak". Bivouac.com. Retrieved May 3, 2016. ^ The elevation of Henry Mountain includes an adjustment of + m (6.68 ft) from NGVD 29 to NAVD 88. ^ "Henry Mountain". Peakbagger.com. Retrieved May 3, 2016. ^ "Henry Mountain". Bivouac.com. Retrieved May 3, 2016. ^ The summit of Hesperus Mountain is the highest point of the La Plata Mountains. ^ The elevation of Hesperus Mountain includes an adjustment of + m (5.41 ft) from NGVD 29 to NAVD 88. ^ "Hesperus Mountain". Peakbagger.com. Retrieved May 3, 2016. ^ "Hesperus Mountain". Bivouac.com. Retrieved May 3, 2016. ^ "Mount Silverthrone". Peakbagger.com. Retrieved May 3, 2016. ^ "Mount Silverthrone". Bivouac.com. Retrieved May 3, 2016. ^ The elevation of Jacque Peak includes an adjustment of + m (6.12 ft) from NGVD 29 to NAVD 88. ^ "Jacque Peak". Peakbagger.com. Retrieved May 3, 2016. ^ "Jacque Peak". Bivouac.com. Retrieved May 3, 2016. ^ The elevation of Bennett Peak includes an adjustment of + m (5.85 ft) from NGVD 29 to NAVD 88. ^ "Bennett Peak". Peakbagger.com. Retrieved May 3, 2016. ^ "Bennett Peak". Bivouac.com. Retrieved May 3, 2016. ^ The summit of Wind River Peak is the highest point of the southern Wind River Range. ^ "WIND". Datasheet for NGS Station NS0274. U.S. National Geodetic Survey. Retrieved May 3, 2016. ^ "Wind River Peak". Peakbagger.com. Retrieved May 3, 2016. ^ "Wind River Peak". Bivouac.com. Retrieved May 3, 2016. ^ "CONEJOS". Datasheet for NGS Station HL0502. U.S. National Geodetic Survey. Retrieved May 3, 2016. ^ "Conejos Peak". Peakbagger.com. Retrieved May 3, 2016. ^ "Conejos Peak". Bivouac.com. Retrieved May 3, 2016. ^ a b c The summit of Mount Marcus Baker is the highest point of the Chugach Mountains. ^ a b c "Mount Marcus Baker". Peakbagger.com. Retrieved May 3, 2016. ^ a b c "Mount Marcus Baker". Bivouac.com. Retrieved May 3, 2016. ^ a b c The summit of Cloud Peak is the highest point of the Bighorn Mountains. ^ a b c Cloud Peak is the northernmost 4000-meter (13,123-foot) summit of the Rocky Mountains. ^ a b c "CLOUD PEAK". Datasheet for NGS Station PW0524. U.S. National Geodetic Survey. Retrieved May 3, 2016. ^ a b c "Cloud Peak". Peakbagger.com. Retrieved May 3, 2016. ^ a b c "Cloud Peak". Bivouac.com. Retrieved May 3, 2016. ^ The summit of Wheeler Peak is the highest point of the Taos Mountains and the U.S. State of New Mexico. ^ Wheeler Peak is the southernmost 4000-meter (13,123-foot) summit of the Rocky Mountains. ^ "WHEELER". Datasheet for NGS Station GM0779. U.S. National Geodetic Survey. Retrieved May 3, 2016. ^ "Wheeler Peak". Peakbagger.com. Retrieved May 3, 2016. ^ "Wheeler Peak". Bivouac.com. Retrieved May 3, 2016. ^ The summit of Francs Peak is the highest point of the Absaroka Range. ^ "FRANCS PK 2". Datasheet for NGS Station OW0325. U.S. National Geodetic Survey. Retrieved May 3, 2016. ^ "Francs Peak". Peakbagger.com. Retrieved May 3, 2016. ^ "Francs Peak". Bivouac.com. Retrieved May 3, 2016. ^ The summit of Haleakalā is the highest point of the Island of Maui and the westernmost 3000 meter (9842.5-foot) summit of the United States. ^ a b The summit of Shishaldin Volcano is the highest point of Unimak Island and the Aleutian Islands. ^ a b Shishaldin Volcano is the westernmost summit of its elevation in Alaska, the United States, and greater North America. ^ a b "Shishaldin Volcano". Peakbagger.com. Retrieved May 3, 2016. ^ a b "Shishaldin Volcano". Bivouac.com. Retrieved May 3, 2016. ^ The summit of Redoubt Volcano is the highest point of the Chigmit Mountains. ^ Redoubt Volcano is the westernmost summit of its elevation in Alaska and greater North America. ^ "Redoubt Volcano". Peakbagger.com. Retrieved May 3, 2016. ^ "Redoubt Volcano". Bivouac.com. Retrieved May 3, 2016. ^ a b The summit of Mount Baker is the highest point of the northern Cascade Range. ^ a b The elevation of Mount Baker includes an adjustment of + m (4.69 ft) from NGVD 29 to NAVD 88. ^ a b "Mount Baker". Peakbagger.com. Retrieved May 3, 2016. ^ a b "Mount Baker". Bivouac.com. Retrieved May 3, 2016. ^ The summit of Mount Torbert is the highest point of the Tordrillo Mountains. ^ Mount Torbert is the westernmost summit of its elevation in Alaska and greater North America. ^ "Mount Torbert". Peakbagger.com. Retrieved May 3, 2016. ^ "Mount Torbert". Bivouac.com. Retrieved May 3, 2016. ^ The summit of San Jacinto Peak is the highest point of the San Jacinto Mountains. ^ "SAN JACINTO". Datasheet for NGS Station DX5119. U.S. National Geodetic Survey. Retrieved May 3, 2016. ^ "San Jacinto Peak". Peakbagger.com. Retrieved May 3, 2016. ^ "San Jacinto Peak". Bivouac.com. Retrieved May 3, 2016. ^ a b The summit of San Gorgonio Mountain is the highest point of the San Bernardino Mountains. ^ a b The elevation of San Gorgonio Mountain includes an adjustment of + m (4.27 ft) from NGVD 29 to NAVD 88. ^ a b "San Gorgonio Mountain". Peakbagger.com. Retrieved May 3, 2016. ^ a b "San Gorgonio Mountain". Bivouac.com. Retrieved May 3, 2016. ^ a b The summit of Charleston Peak is the highest point of the Spring Mountains. ^ a b "CHARLESTON". Datasheet for NGS Station GR1965. U.S. National Geodetic Survey. Retrieved May 3, 2016. ^ a b "Charleston Peak". Peakbagger.com. Retrieved May 3, 2016. ^ a b "Charleston Peak". Bivouac.com. Retrieved May 3, 2016. ^ The summit of Mount Pavlof is the highest point of the Alaska Peninsula. ^ "Mount Pavlof". Peakbagger.com. Retrieved May 3, 2016. ^ "Mount Pavlof". Bivouac.com. Retrieved May 3, 2016. ^ a b The summit of Mount Veniaminof is the highest point of the Alaska Peninsula. ^ a b "Mount Veniaminof". Peakbagger.com. Retrieved May 3, 2016. ^ a b "Mount Veniaminof". Bivouac.com. Retrieved May 3, 2016. ^ "MOUNT ADAMS". Datasheet for NGS Station SB1004. U.S. National Geodetic Survey. Retrieved May 3, 2016. ^ "Mount Adams". Peakbagger.com. Retrieved May 3, 2016. ^ "Mount Adams". Bivouac.com. Retrieved May 3, 2016. ^ a b The summit of Mount Isto is the highest point of the Brooks Range. ^ a b Mount Isto is the northernmost ultra-prominent summit of Alaska and the United States. ^ a b "Mount Isto". Peakbagger.com. Retrieved May 3, 2016. ^ a b "Mount Isto". Bivouac.com. Retrieved May 3, 2016. ^ Iliamna Volcano is the westernmost 3000-meter (9843-foot) summit of Alaska and greater North America. ^ "Iliamna Volcano". Peakbagger.com. Retrieved May 3, 2016. ^ "Iliamna Volcano". Bivouac.com. Retrieved May 3, 2016. ^ a b The summit of Mount Olympus is the highest point of the Olympic Mountains. ^ a b "MT OLYMPUS". Datasheet for NGS Station SY1857. U.S. National Geodetic Survey. Retrieved May 3, 2016. ^ a b "Mount Olympus". Peakbagger.com. Retrieved May 3, 2016. ^ a b "Mount Olympus". Bivouac.com. Retrieved May 3, 2016. ^ The summit of Mount Hood is the highest point of the Oregon Cascades and the U.S. State of Oregon. ^ "MOUNT HOOD HIGHEST POINT". Datasheet for NGS Station RC2244. U.S. National Geodetic Survey. Retrieved May 3, 2016. ^ "Mount Hood". Peakbagger.com. Retrieved May 3, 2016. ^ "Mount Hood". Bivouac.com. Retrieved May 3, 2016. ^ "Mount Tom White". Peakbagger.com. Retrieved May 3, 2016. ^ "Mount Tom White". Bivouac.com. Retrieved May 3, 2016. ^ a b The summit of Wheeler Peak is the highest point of the Snake Range. ^ a b "WHEELER PEAK". Datasheet for NGS Station JP0339. U.S. National Geodetic Survey. Retrieved May 3, 2016. ^ a b "Wheeler Peak". Peakbagger.com. Retrieved May 3, 2016. ^ a b "Wheeler Peak". Bivouac.com. Retrieved May 3, 2016. ^ "GLACIER PEAK". Datasheet for NGS Station TQ0506. U.S. National Geodetic Survey. Retrieved May 3, 2016. ^ The elevation of Glacier Peak includes an adjustment of + m (4.9 ft) from NGVD 29 to NAVD 88. ^ "Glacier Peak". Peakbagger.com. Retrieved May 3, 2016. ^ "Glacier Peak". Bivouac.com. Retrieved May 3, 2016. ^ The summit of Mount Kimball is the highest point of the Delta Range. ^ "Mount Kimball". Peakbagger.com. Retrieved May 3, 2016. ^ "Mount Kimball". Bivouac.com. Retrieved May 3, 2016. ^ a b "Mount Griggs". Peakbagger.com. Retrieved May 3, 2016. ^ a b "Mount Griggs". Bivouac.com. Retrieved May 3, 2016. ^ "Mount Crillon". Peakbagger.com. Retrieved May 3, 2016. ^ "Mount Crillon". Bivouac.com. Retrieved May 3, 2016. ^ a b The summit of Mount Vsevidof is the highest point of Umnak Island and the Fox Islands. ^ a b Mount Vsevidof is the westernmost 2000-meter (6562-foot) summit of Alaska, the United States, and greater North America. ^ a b "Mount Vsevidof". Peakbagger.com. Retrieved May 3, 2016. ^ a b "Mount Vsevidof". Bivouac.com. Retrieved May 3, 2016. ^ The summit of Mount Hesperus is the highest point of the western Alaska Range. ^ Mount Hesperus is the westernmost summit of its elevation in Alaska and greater North America. ^ "Mount Hesperus". Peakbagger.com. Retrieved May 3, 2016. ^ "Mount Hesperus". Bivouac.com. Retrieved May 3, 2016. ^ "Mount Drum". Peakbagger.com. Retrieved May 3, 2016. ^ "Mount Drum". Bivouac.com. Retrieved May 3, 2016. ^ "Mount Chiginagak". Peakbagger.com. Retrieved May 3, 2016. ^ "Mount Chiginagak". Bivouac.com. Retrieved May 3, 2016. ^ a b The summit of Sacajawea Peak is the highest point of the Wallowa Mountains and the Columbia Plateau. ^ a b The elevation of Sacajawea Peak includes an adjustment of + m (5.12 ft) from NGVD 29 to NAVD 88. ^ a b "Sacajawea Peak". Peakbagger.com. Retrieved May 3, 2016. ^ a b "Sacajawea Peak". Bivouac.com. Retrieved May 3, 2016. ^ The summit of Mount Neacola is the highest point of the Neacola Mountains. ^ "Mount Neacola". Peakbagger.com. Retrieved May 3, 2016. ^ "Mount Neacola". Bivouac.com. Retrieved May 3, 2016. ^ The summit of Mount Graham is the highest point of the Pinaleño Mountains. ^ "GRAHAM". Datasheet for NGS Station CY1235. U.S. National Geodetic Survey. Retrieved May 3, 2016. ^ "Mount Graham". Peakbagger.com. Retrieved May 3, 2016. ^ "Mount Graham". Bivouac.com. Retrieved May 3, 2016. ^ The summit of Mount Mitchell is the highest point of the Appalachian Mountains, the State of North Carolina, and the eastern United States. ^ Mount Mitchell is the easternmost 2000-meter (6562-foot) summit of the United States. ^ The elevation of Mount Mitchell includes an adjustment of + m (0.08 ft) from NGVD 29 to NAVD 88. ^ "Mount Mitchell". Peakbagger.com. Retrieved May 3, 2016. ^ "Mount Mitchell". Bivouac.com. Retrieved May 3, 2016. ^ The summit of Mount Washington is the highest point of the White Mountains, the State of New Hampshire, and the northeastern United States. ^ Mount Washington is the easternmost ultra-prominent summit of the United States. ^ "MT WASH". Datasheet for NGS Station PF0951. U.S. National Geodetic Survey. Retrieved May 3, 2016. ^ The elevation of Mount Washington includes an adjustment of + m (0.07 ft) from NGVD 29 to NAVD 88. ^ "Mount Washington". Peakbagger.com. Retrieved May 3, 2016. ^ "Mount Washington". Bivouac.com. Retrieved May 3, 2016. ^ The summit of Tanaga Volcano is the highest point of Tanaga Island and the Andreanof Islands. ^ Tanaga Volcano is the westernmost summit of its elevation in Alaska, the United States, and greater North America. ^ "Tanaga Volcano". Peakbagger.com. Retrieved May 3, 2016. ^ "Tanaga Volcano". Bivouac.com. Retrieved May 3, 2016. ^ The summit of Signal Hill is the highest point of the Ouachita Mountains and the U.S. State of Arkansas. ^ The elevation of Signal Hill includes an adjustment of + m (0.25 ft) from NGVD 29 to NAVD 88. ^ "Signal Hill". Peakbagger.com. Retrieved May 3, 2016. ^ "Signal Hill". Bivouac.com. Retrieved May 3, 2016. ^ The summit of Mount Osborn is the highest point of the Seward Peninsula. ^ "MT OSBORN". Datasheet for NGS Station UW3831. U.S. National Geodetic Survey. Retrieved May 3, 2016. ^ "Mount Osborn". Peakbagger.com. Retrieved May 3, 2016. ^ The summit of Mount Igikpak is the highest point of the Schwatka Mountains. ^ "Mount Igikpak". Peakbagger.com. Retrieved May 3, 2016. ^ "Mount Igikpak". Bivouac.com. Retrieved May 3, 2016. ^ The summit of Humphreys Peak is the highest point of the San Francisco Peaks and the U.S. State of Arizona. ^ The elevation of Humphreys Peak includes an adjustment of + m (4.41 ft) from NGVD 29 to NAVD 88. ^ "Humphreys Peak". Peakbagger.com. Retrieved May 3, 2016. ^ "Humphreys Peak". Bivouac.com. Retrieved May 3, 2016. ^ The summit of Kawaikini is the highest point of the Island of Kauaʻi. ^ "Hall Island high point". Peakbagger.com. Retrieved May 3, 2016. ^ The summit of Kuskokwim high point is the highest point of the Kuskokwim Mountains. ^ "Kuskokwim high point". Peakbagger.com. Retrieved May 3, 2016. ^ The summit of Spruce Knob is the highest point of the Allegheny Mountains and the U.S. State of West Virginia. ^ "SPRUCE". Datasheet for NGS Station HW3569. U.S. National Geodetic Survey. Retrieved May 3, 2016. ^ "Spruce Knob". Peakbagger.com. Retrieved May 3, 2016. ^ The summit of Sierra Blanca Peak is the highest point of the Sacramento Mountains. ^ "SIERRA BLANCA". Datasheet for NGS Station DR1010. U.S. National Geodetic Survey. Retrieved May 3, 2016. ^ "Sierra Blanca Peak". Peakbagger.com. Retrieved May 3, 2016. ^ "Sierra Blanca Peak". Bivouac.com. Retrieved May 3, 2016. ^ The summit of Katahdin is the highest point of the Longfellow Mountains and the U.S. State of Maine. ^ Katahdin is the easternmost 1000-meter (3281-foot) summit of the United States. ^ "KATAHDIN 2". Datasheet for NGS Station QG1451. U.S. National Geodetic Survey. Retrieved May 3, 2016. ^ "Peak 4030". Peakbagger.com. Retrieved May 3, 2016. ^ The summit of Mount Baldy is the highest point of the White Mountains. ^ "BALDY". Datasheet for NGS Station DT0788. U.S. National Geodetic Survey. Retrieved May 3, 2016. ^ "Mount Baldy". Peakbagger.com. Retrieved May 3, 2016. ^ "Mount Baldy". Bivouac.com. Retrieved May 3, 2016. ^ The summit of Borah Peak is the highest point of the Lost River Range and the U.S. State of Idaho. ^ "BEAUTY RESET". Datasheet for NGS Station PZ0770. U.S. National Geodetic Survey. Retrieved May 3, 2016. ^ "Borah Peak". Peakbagger.com. Retrieved May 3, 2016. ^ "Borah Peak". Bivouac.com. Retrieved May 3, 2016. ^ The summit of Black Elk Peak is the highest point of the Black Hills and the U.S. State of South Dakota. ^ "HARNEY". Datasheet for NGS Station OT0810. U.S. National Geodetic Survey. Retrieved August 16, 2016. ^ "Black Elk Peak". Peakbagger.com. Retrieved August 16, 2016. ^ "Black Elk Peak". Bivouac.com. Retrieved August 16, 2016. ^ The summit of Slide Mountain is the highest point of the Catskill Mountains. ^ "SLIDE". Datasheet for NGS Station LY2488. U.S. National Geodetic Survey. Retrieved May 3, 2016. ^ "Slide Mountain". Peakbagger.com. Retrieved May 3, 2016. ^ The summit of Junipero Serra Peak is the highest point of the Santa Lucia Range. ^ The elevation of Junipero Serra Peak includes an adjustment of + m (3.19 ft) from NGVD 29 to NAVD 88. ^ "Junipero Serra Peak". Peakbagger.com. Retrieved May 3, 2016. ^ "Junipero Serra Peak". Bivouac.com. Retrieved May 3, 2016. ^ The summit of Mount Marcy is the highest point of the Adirondack Mountains, the U.S. State of New York, and the drainage basins of the Gulf of Saint Lawrence and the Hudson River. ^ "MARCY". Datasheet for NGS Station PG2096. U.S. National Geodetic Survey. Retrieved May 3, 2016. ^ "Mount Marcy". Peakbagger.com. Retrieved May 3, 2016. ^ The elevation of Steens Mountain includes an adjustment of + m (4.91 ft) from NGVD 29 to NAVD 88. ^ "Steens Mountain". Peakbagger.com. Retrieved May 3, 2016. ^ "Steens Mountain". Bivouac.com. Retrieved May 3, 2016. ^ The summit of Tooth Benchmark is the highest point of Saint Lawrence Island and the islands of the Bering Sea. ^ "TOOTH". Datasheet for NGS Station UW3479. U.S. National Geodetic Survey. Retrieved May 3, 2016. ^ "Tooth Benchmark". Peakbagger.com. Retrieved May 3, 2016. ^ The summit of Delano Peak is the highest point of the Tushar Mountains. ^ "DELANO PEAK M 5". Datasheet for NGS Station JO0502. U.S. National Geodetic Survey. Retrieved May 3, 2016. ^ "Delano Peak". Peakbagger.com. Retrieved May 3, 2016. ^ "Delano Peak". Bivouac.com. Retrieved May 3, 2016. ^ The summit of Black Mountain is the highest point of the De Long Mountains. ^ "Black Mountain". Peakbagger.com. Retrieved May 3, 2016. ^ The summit of Mount Tozi is the highest point of the Ray Mountains. ^ "Mount Tozi". Peakbagger.com. Retrieved May 3, 2016. ^ The summit of Mount Cleveland is the highest point of the Lewis Range. ^ "CLEVELAND". Datasheet for NGS Station TM1009. U.S. National Geodetic Survey. Retrieved May 3, 2016. ^ "Mount Cleveland". Peakbagger.com. Retrieved May 3, 2016. ^ "Mount Cleveland". Bivouac.com. Retrieved May 3, 2016.